Removing Ads On Website Improved Its Ad Earnings?! Why Removing Ads On Website Improved Its Ad Earnings?! It seems crazy, right? The idea that your website would actually earn more revenue from showing fewer ads. What if I told you that this would also result in lower RPMs and CPMs BUT higher overall ad earnings. Absurd? Maybe not. This is the concept John Cole and myself recently explored at Google in New York during Pubtelligence, a Google-hosted event designed just for digital publishers. We took a deep dive into the economics of digital publishing and discovered two things that influenced website ad revenue more than ALMOST ANY OTHER FACTORs. 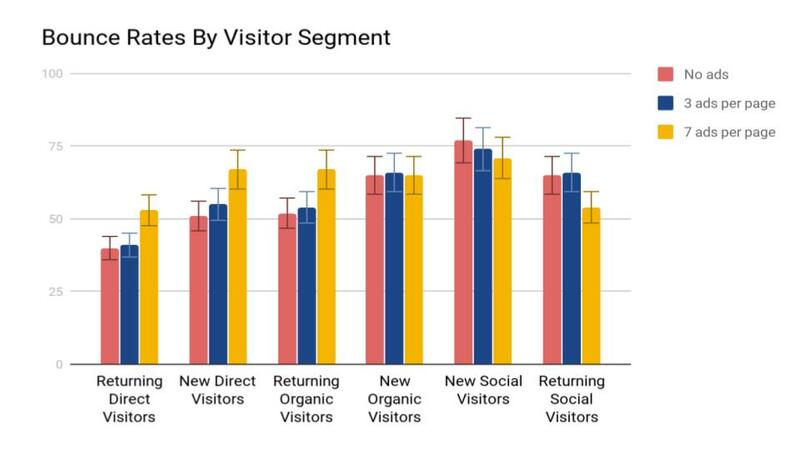 These factors were visitor engagement and visitor behavior. We learned that these can both be manipulated and influenced to produce greater ad revenue and better user experiences; however, many publishers may be approaching these subjects in the opposite way that they should be. Below, I’ll highlight how to improve visitor engagement to increase the value of ads on website spaces. 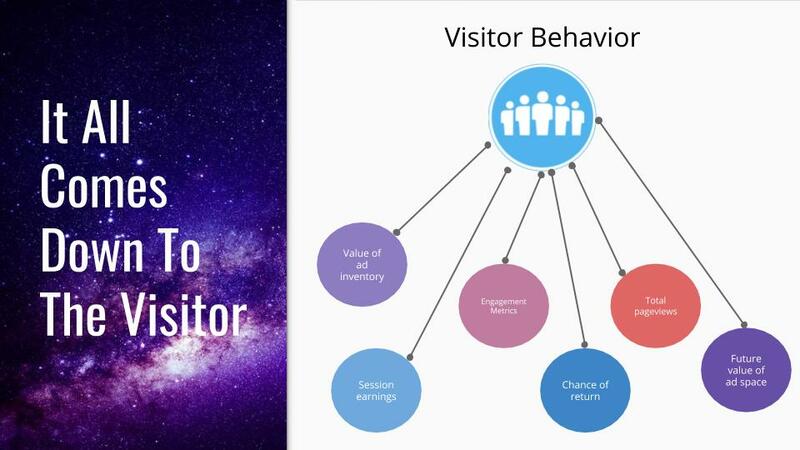 I’ll also show you how to influence visitor behavior to enhance overall session earnings for every individual visitor. The advertising ecosystem has never been filled with a more difficult group of parties to please. That includes platforms — like Google and Facebook — advertisers, and visitors. Platforms are ever increasing their rules and policy regulations for publishers and advertisers alike. Just recently we learned of new “ad experience” reports and guidelines from Google that publishers will be forced to adhere to (otherwise their ads will be blocked by Chrome). Advertisers are leveraging new technology and sophisticated data to divide and segment visitors to improve the way they buy publisher inventory; forcing publishers to account for things like viewability and other metrics. Finally, visitors expect more from their web experience than ever before. They expect cross-device synchronicity and are expecting richer mobile experiences. Adapting to these trends has become no easy feat. With all this in mind, publishers must still find ways to profit and grow. Yet, these increasing demands of the ecosystem are making it more difficult than it had been in the past. Publishers need more data and better direction to capitalize and to avoid leaving revenue on the table. What we’ve learned is that this process of pleasing multiple parties and trying to turn a profit over time can lead to “over monetization”. This essentially just means that there are too many competing elements on the page that ultimately cannibalize the visitor’s attention; which works against publishers in two ways. 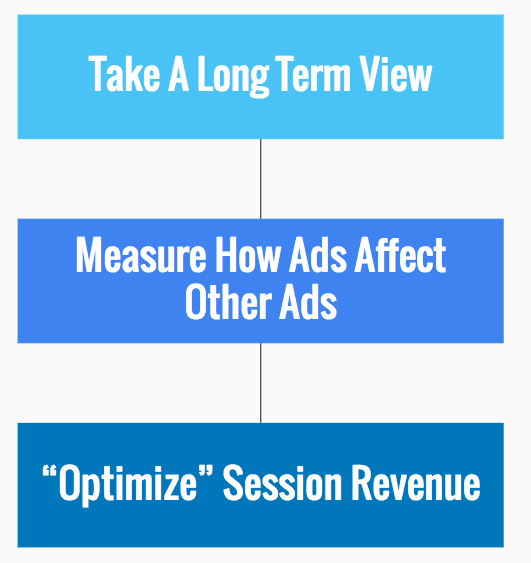 First, it could potentially end their session early; costing you pageviews and revenue. 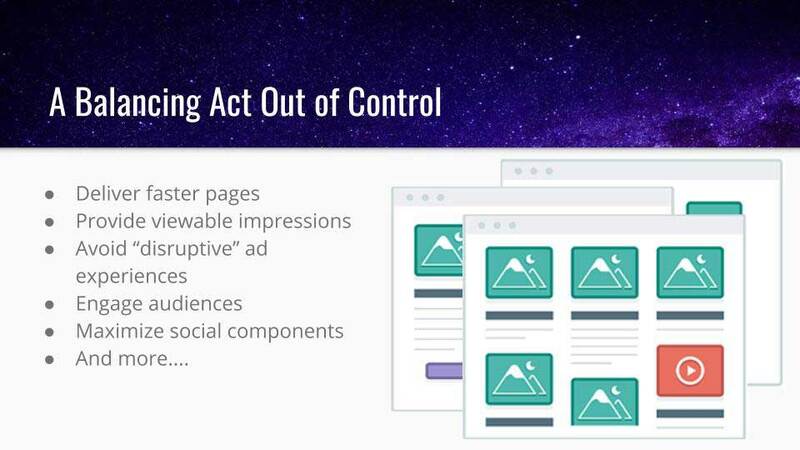 Second, visitor attention is what advertisers are buying when they bid on your ad space programmatically. 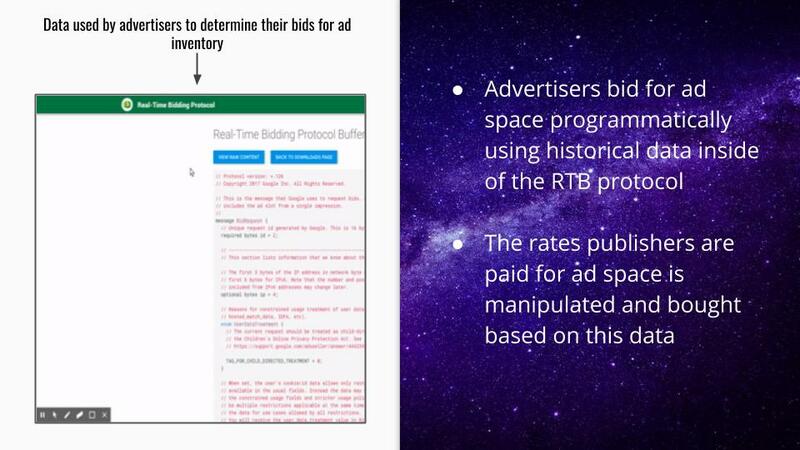 Since they are bidding on auctions inside of exchanges, they may not bid on certain ad space unless it is getting a certain level of attention (click-through-rate, viewability, campaign performance). Improperly accounting for both of these factors means that you could see shorter sessions and less competition among advertisers bidding on your ad space in programmatic exchanges. If your website is loaded up with… native ads, display ads, social media widgets, video media, video ads, comment sections, and other competing variables you may not know when is too much for your visitors. Below, I’ll give you an example of how over-monetization of web pages takes place. Most digital advertising that takes place on publisher pages happens programmatically. This occurs in large exchanges where advertisers bid for certain audiences they want. These bids are placed based on historical data. They look at specific locations on certain pages that perform according to rules that they have put forth to help them achieve campaign goals. 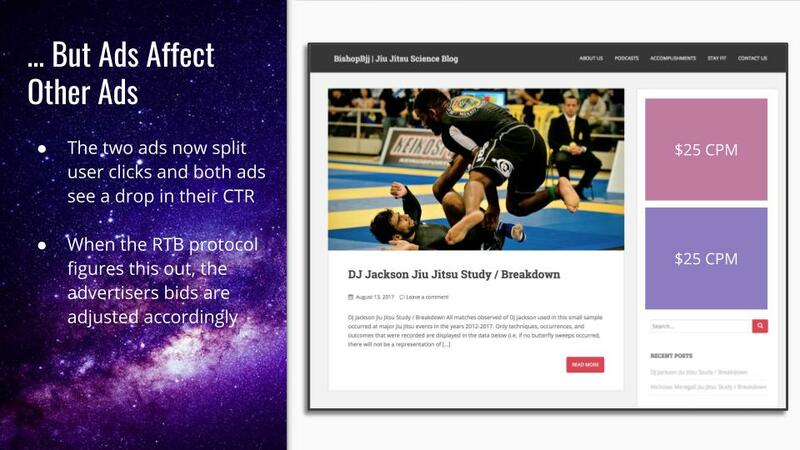 In this example, I’m going to show how an advertiser will begin advertising on your website via a programmatic exchange. This is an example of how publishers “optimizing” around CPMs and RPMs can find themselves quickly losing revenue if they don’t know how to measure things like EPMV (earnings per thousand visitors) or authentic user engagement. 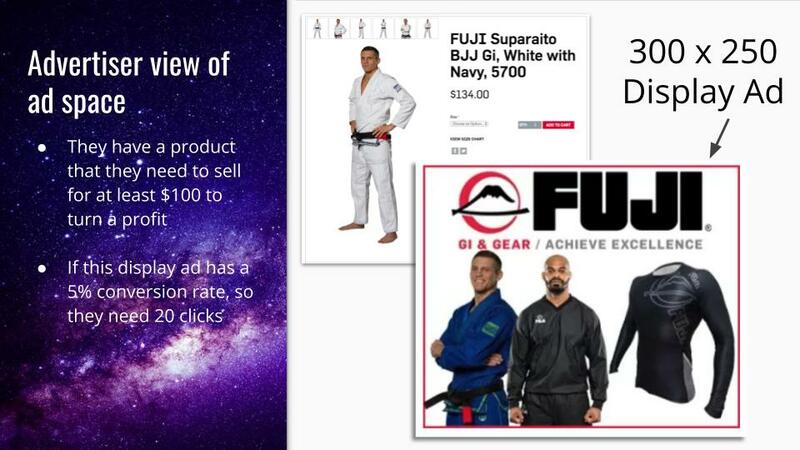 The advertiser here is a jiu jitsu uniform company. They may be doing some form of retargeting via an advertising platform like Google AdWords. My jiu jitsu website may be a place where these ads would potentially show; meaning that this advertiser would put Google ads on my website via Google AdSense or Google’s Ad Exchange. Let’s say the advertiser has to sell their product for at least $100 to make a profit. They may know that this 300x250 ad gets an average a 5% click-through-rate (CTR); which means it would need to generate 20 clicks to reach their campaign goal. This means that — programmatically — the protocols inside of the auction will help them seek out ad space that will help them meet these goals through targeting and historical ad space data. Let’s pretend my website has a sidebar location that has a historical record of a 1% CTR. This is the perfect location for their 300x250 ad. They could bid up to a $50 CPM for this space and still achieve their campaign goal. As a publisher, I may be taking a close look at my CPMs when trying to optimize my overall revenue. As soon as I learn that I have a $50 CPM on my site, I may look to capitalize on this page. Perhaps this is a particularly high CPM for my website. A common way that ad ops and webmasters will approach optimizing this information is to conduct an A/B test to learn about the financial impact of including other ads on the page. In this case, the publisher may elect to try another 300x250 in the same location to see if lightning can strike twice. Since advertiser bids are based on historical data, it wouldn’t be unlikely for us to see that ad location also receive a $50 CPM. This would make the RPM (or eCPM) of this page nearly double from what it was before (but wait)! This test seems like a success so it would make sense to make this addition permanent. Unfortunately, ads have a strong impact on other ads — and a dramatic impact on visitor behavior. Over time, those ads will dilute each other; meaning that 1% CTR that ad space had will likely degrade. This means that the historical bidding data will change and advertisers will have bids automatically adjusted to compensate. In this case, for simplicity, we’ll say the ads split the CTR. If these ads split the CTR, that would mean that the CPMs could now be cut in half (assuming the same advertiser and data from our simple example above) and the page RPM is now back to what it was before. Yikes! This is why you often hear about publishers complaining of ad rates dropping when they are actually on the rise. The addition of more and more ads on a page means that ad rates may be declining on a particular publishers site. However, ad rates — in general — are rising, its the publisher’s ad inventory (or ad space) that is being eroded. This typically takes place over long periods of time, so this erosion of ad value over time is not always attributed to the addition of ads or technology from 6 months ago. Unfortunately, this means that publishers will often dig themselves an even deeper hole by returning the tool that may have brought them here in the first place (which is why A/B testing ads won’t work). Returning to our example, testing a 3rd ad in this valuable location may be a method that is used to see if sagging revenues can be increased once again. Since the value of this space is determined by historical data, I am likely to get another high CPM. Unfortunately, we know that if this change is made permanently that these ads will likely dilute each other even more; resulting in a decline in value of all three ads once again. In this example, we simplify once again and suggest that the ads are equally diluted; resulting in even lower CPMs. This means we are now showing 3x as many ads we were before and making the exact same RPM! While this example is a simplification of how some of this works, this concept is precisely what happens on thousands of publisher pages every day. Changes relating to things like ad placement and ad density may not take effect until 3-6 months down the line. But that’s not all, instead of showing 3x as many ads and making the same amount of total revenue. In this example, the publisher will likely lose revenue overall. This means that even a simple 12.5% increase in bounce rate could cause a drop in the average pageviews per visit; resulting in less overall pageviews from each session. This decrease in avg. 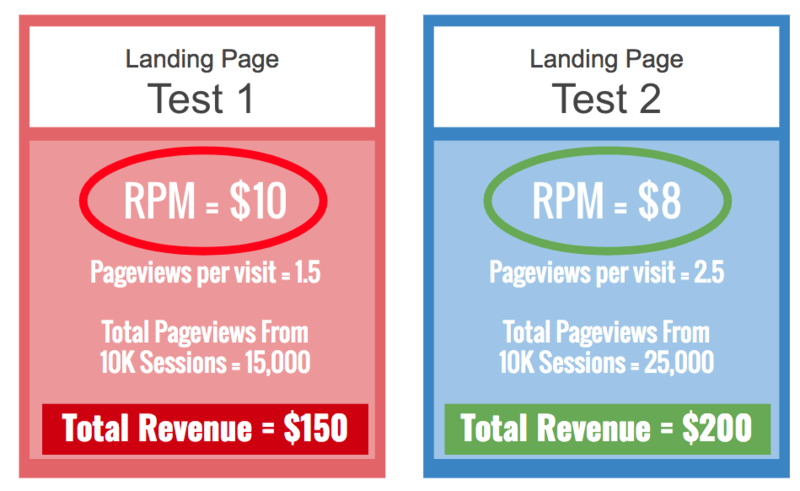 pageviews per visit can affect the overall amount of revenue earned from each session. This means — on average — visitors are visiting less pages when they start from our original landing page; resulting in fewer pageviews and fewer ad impressions. This means that our revenue per session is actually going down! Revenue per session ( or EPMV — earnings per thousand visitors) is the best way to determine if you are actually earning more or less revenue over time. 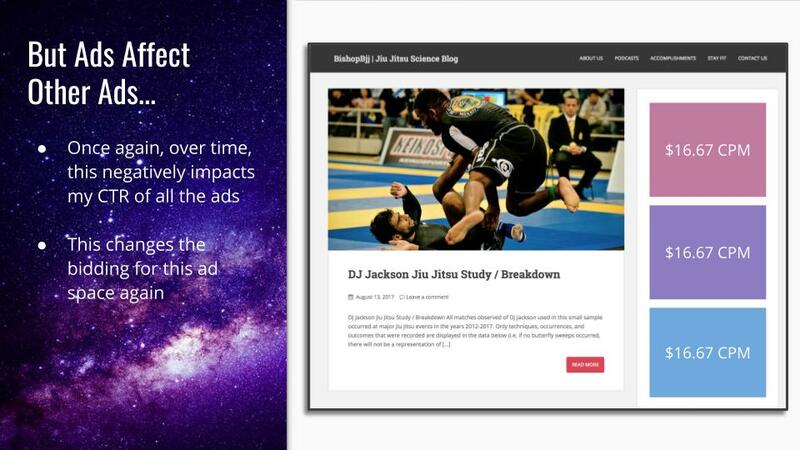 In our example, the increased ad density actually caused a decrease in avg. pageviews per visit. This led to overall less session earnings than before. 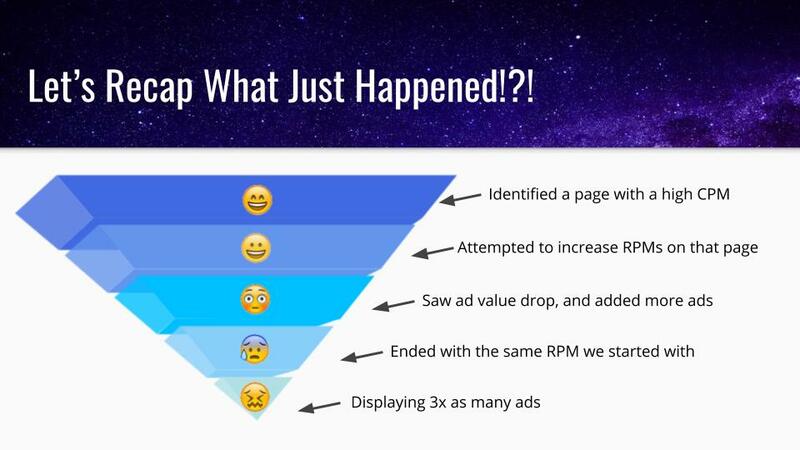 This is what leads to over-monetization and it can be avoided by taking a long-term look at how ads and other technology impact visitor behavior and ad inventory value. This starts with understanding that ads affect other ads. This means that changes to the way you monetize your site can affect both the physical value of your ad space (the amount you earn per ad) and the visitor’s behavior (directly affecting the number of pageviews you can monetize with them per session) over time. To understand the trends behind both of these things combines — accounting for seasonality and traffic variability — EPMV, or session revenue, is the best way to keep a true north. Understanding EPMV by landing page can help you ensure you’re not too focused on RPMs that you’re missing out on higher session revenue by understanding the effect of visitor behavior on revenue. For example, as we saw above, a high landing page RPM can be good; unless that high RPM is negatively impacting pageviews to the point that is decreasing the amount of overall session revenue (i.e. visitors get annoyed and leave before reaching additional pages that can also be monetized). I deeply discussed a case study we did on actual page engagement and ad value here. Basically, there is a direct correlation between the value of ad space to advertisers and actual visitor engagement — time spent engaged in content; NOT waiting for pages to loading, scrolling quickly, navigating in the menu, or browsing in another tab. You can learn about actual visitor engagement time here. The reason for this makes total sense too. If a visitor is actually reading and engaging with a website’s content they are much more likely to view ads, click on them, and complete activities associated with the advertiser’s campaign (i.e. buy something from them). Viewability, CTR, and campaign performance are exactly what advertisers are bidding on in programmatic auctions. By improving engagement, you are making your ad space more valuable in these auctions: driving up prices and competition for your inventory. Rather than optimizing for CPMs and RPMs, you need to be looking at EPMV and session revenue by landing page to ensure long-term website revenue growth. 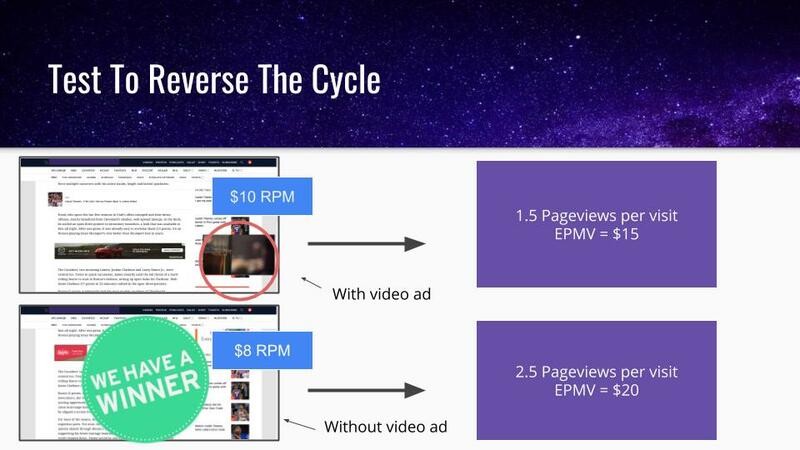 If we return to our example from the beginning; of a page that was “over-monetized” — with too many ads, videos, widgets, and other technology — we can actually test our way out of this vicious cycle. By testing elements on the page, we can learn if the technology or ads on the pages, are negatively impacting the overall revenue of visitors landing on those pages. In this case, we are going to test that auto-play video that hovers as visitors scroll on desktop devices. That video may play an ad which helps us generate a higher RPM than we had without the video. But, when we look at the ad’s impact on avg. 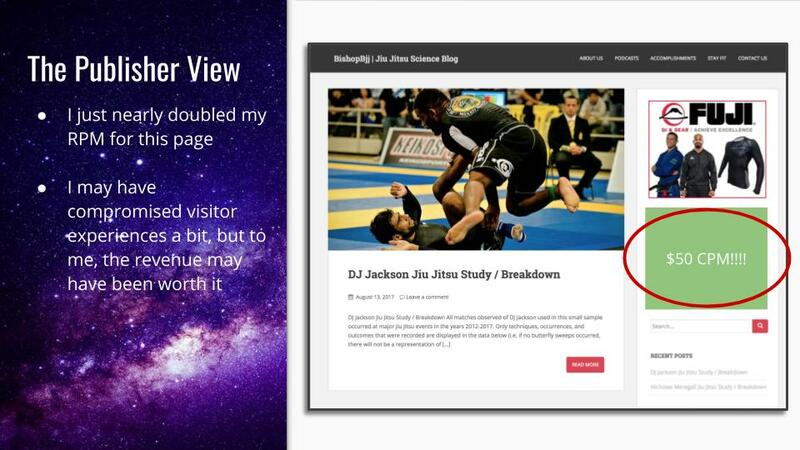 pageviews per visit of visitors landing on the page, we see that they visit fewer pages overall than the visitors that don’t see the video. This has a big impact on overall session revenue; meaning that the video is actually COSTING THEM MONEY AND ANNOYING USERS. Website visitors affect publisher revenue in two ways. 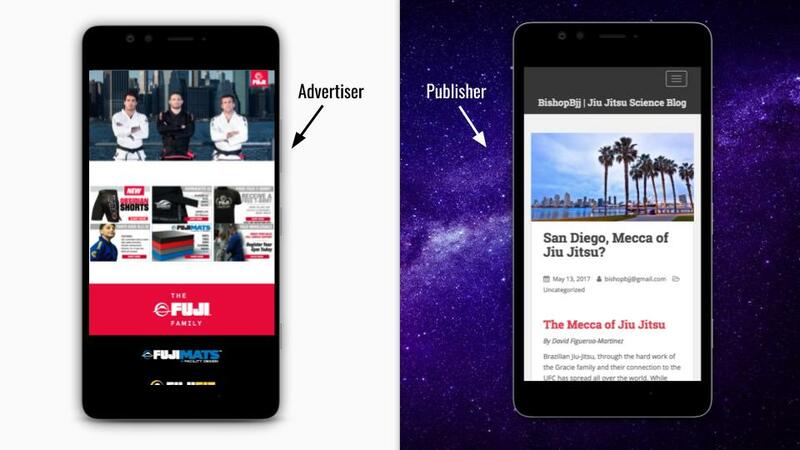 Visitor engagement directly impacts the value of publisher ad space to advertisers. If you can improve things like average engaged pageviews, you can increase the amount advertisers are willing to pay for your ad space. Visitors actually impact most of what is important to website owners and digital publishers. Instead of focusing on all the parties to please, focus on pleasing the visitors first. Visitors will positively impact all of your other key performance indicators. 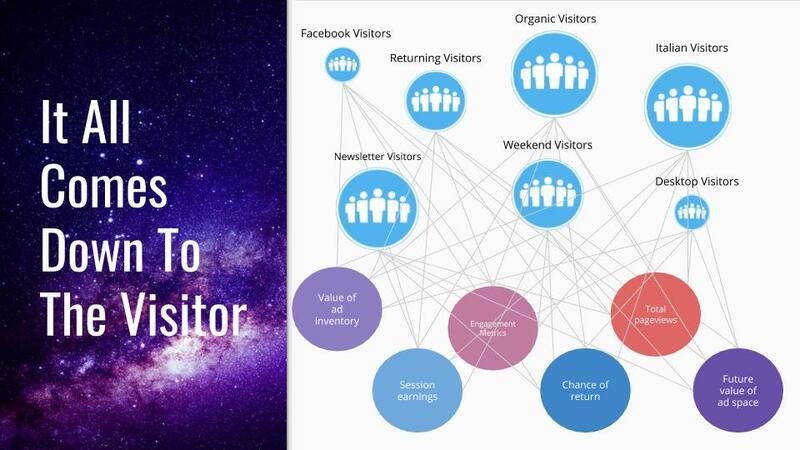 Unfortunately, visitor behavior isn’t a singular thing. It’s different from site to site, page by page, and segment by segment. That’s why it’s hard to project if you are earning a “good ad rate” currently or not. I encourage all website owners to ensure they are doing something to segment and treat visitors differently. The research overwhelmingly says that treating visitors differently may be one of the most impactful things you can do for SEO, revenue, and visitor experience metrics. Many publishers are over-monetizing their sites — or at least overloading their users. This cannot be seen by looking at RPMs or CPMs. 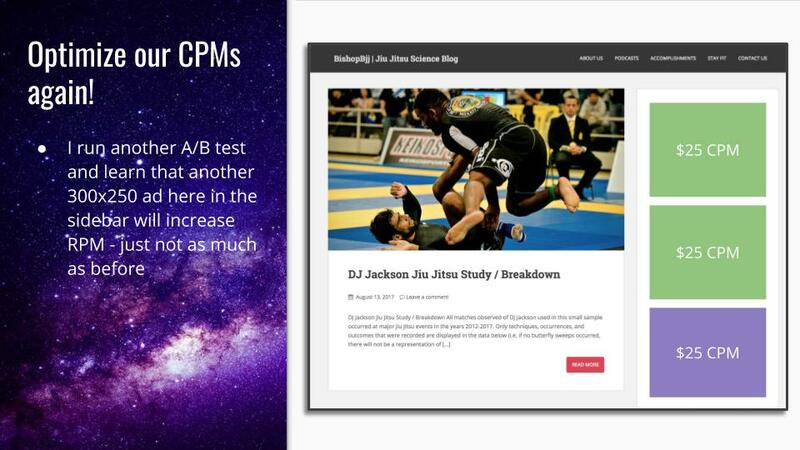 Optimizing for RPMs and CPMs leads many publishers down this path. Understanding and running tests that account for how changes affect EPMV (or session revenue) will help prevent these risks. 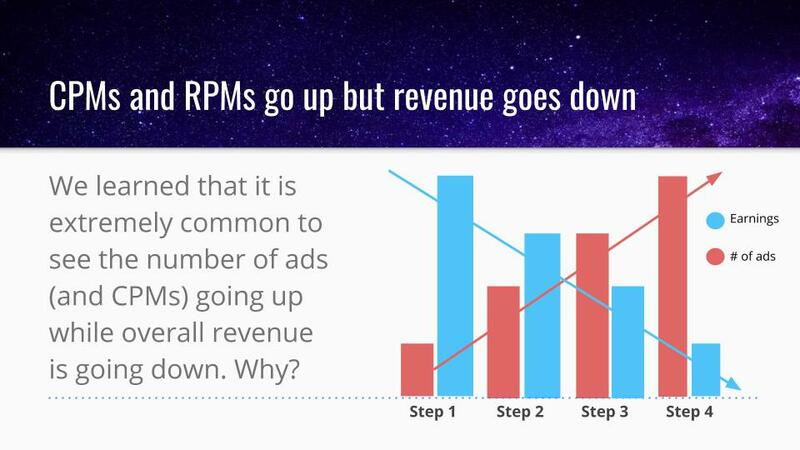 Optimizing for EPMV is also the best way to ensure you keep revenue per visitor going up over time. Most of what is written in the post is correct with one major exception. earnings per session is not linear, meaning earnings on page 2 are less than on page 1 and earnings on page 3 are even lower. 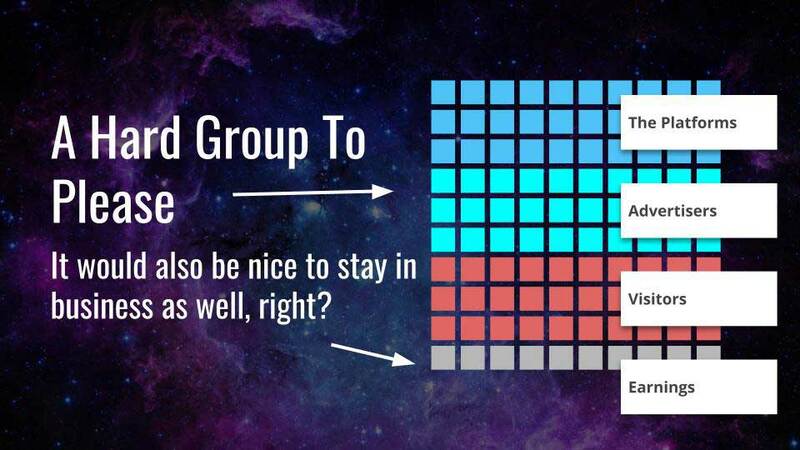 I would assume by about 30 percent each. Thomas, this actually isn’t true. It may be for certain properties that you manage, but from our many many studies this is a false assumption. There will be a new blog later today that highlights how visitor behavior actually plays a larger role in this than anything else. If you do a lot of slideshows (ala old school Buzzfeed articles) it is common to see this; as page engagement will go down with each subsequent pageview; thus the lower value. It’s really the value and engagement of the pageview that makes the difference, not the order in which it is registered. Hi Tyler. Am big fan of your normally very detailed posts relating to Adsense like this one and SEO in general. I have a question relating to adsense that I have searched and not found any satisfactory response. Since I started using Adsense six months ago, my performance reports(shown in adsense home) has never been used to calculate my earnings. It doesn’t look like this is because of any invalid activity since all those statistics make sense to me based on the organic searches I get. Moreover, this has been happening daily and these statistics get recorded. For instance, according to perfomance reports card, daily I receive around 5000-6000 pageviews, 9000-11000 ad impressions and around 2% CTR or 100-150 clicks. Yet daily earnings rarely surpass or reach a dollar. The CPC is stuck at 0.03, my niche is programming and I receive around 1000 organic searches daily according to Google Analytics with each user viewing at least 2 pages. I have around 3 or 4 ads per page and they display correctly according to different browsers. So yesterday I realized that Adsense uses mysterious figures in the Ad Units Card in Adsense homepage which massively seem to under-report my statistics. For instance it shows me that I get around 4 or 5 clicks per day and shows me less than half the ad impressions. Yet this has been going on for six months. My question, is which statistics normally get used for calculating earnings and which should I believe. Or could something be going wrong in my account. Hey Clemy, thanks for the details in your question. I think I follow your calculations. Are you receiving impressions on all of your pages? Is it possible some pages have issues that are causing ads not to display? I’m not sure why AdSense is reporting two different measurements for you. The first set of stats seem to line-up, the second set, not as much. Google’s AdSense forum may be a better place for this question… or /r/adsense; as there may be other AdSense users with a quicker answer. If when you generate reports numbers don’t much when you set some criteria that shouldn’t affect, check if you have enabled autoads, because you need to sum that statistics that you have to access directly from the auto ads section. To be sincere I decided to give this a shot and the outcome amazed me. This is absolutely correct. I actually reduced my ads from 8 to 4 on each post page and my daily revenue has increased. I removed all the scripts and all that involved, but ezoic still works on the blog. Is there a way to find it thoroughly? Thank you for your support. Hey Susan, I’m not sure I 100% understand the question. What is it that you’re trying to figure out.